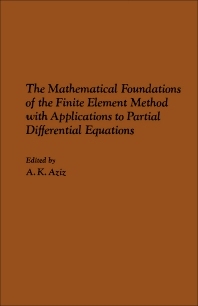 The Mathematical Foundations of the Finite Element Method with Applications to Partial Differential Equations is a collection of papers presented at the 1972 Symposium by the same title, held at the University of Maryland, Baltimore County Campus. This symposium relates considerable numerical analysis involved in research in both theoretical and practical aspects of the finite element method. This text is organized into three parts encompassing 34 chapters. Part I focuses on the mathematical foundations of the finite element method, including papers on theory of approximation, variational principles, the problems of perturbations, and the eigenvalue problem. Part II covers a large number of important results of both a theoretical and a practical nature. This part discusses the piecewise analytic interpolation and approximation of triangulated polygons; the Patch test for convergence of finite elements; solutions for Dirichlet problems; variational crimes in the field; and superconvergence result for the approximate solution of the heat equation by a collocation method. Part III explores the many practical aspects of finite element method. This book will be of great value to mathematicians, engineers, and physicists.